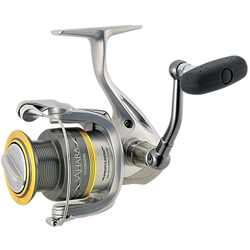 By building in the advanced Propulsion Line Management System, Shimano has upped the performance level of one of their most popular reels. The 5-part system greatly reduces friction and line slap, ensuring longer casts and smoother retrieves. Meanwhile, the Sahara retains all the great features that have made it such a solid performer: exclusive S Concept technology, lightweight graphite sideplate and rotor, cold forged aluminum spool, Fluidrive II, Floating Shaft, Dyna-Balance system, Super Stopper II instant anti-reverse, Slow Oscillation, powerful machined aluminum handle, and a maintenance port for quick lube touchups. Equipped with 3 shielded S A-RB stainless steel ball bearings and a roller bearing. Bought this reel and I absolutely love it!! Lined it up with Suffix Braid and I just can't put it down. Looking to catch alot of bass with this one fa show!!! A must buy......."
"I HAVE WENT THRU 2 JM 1000 AND HAD PROBLEMS WITH THE REEL TOOK THE JM 1000 BACK GOT 20.00 BACK AND A MUCH BETTER REEL SMOOTHER AND BETTER DRAG." "I bought this reel last spring along with an All Star GT40X rod and love it. It casts a mile and the retrieve is smooth. You wont regret this purchase. Shimano is an industry leader and it shows with this product for sure." "If you are like me and dont have a buch of money to spend all the time and you like Finnese Techniques then the Sahara is going to be the best reel you have ever bought. I bought it last year and during the whole 2008 season i never had any problems with it. THE BEST BUY EVER"